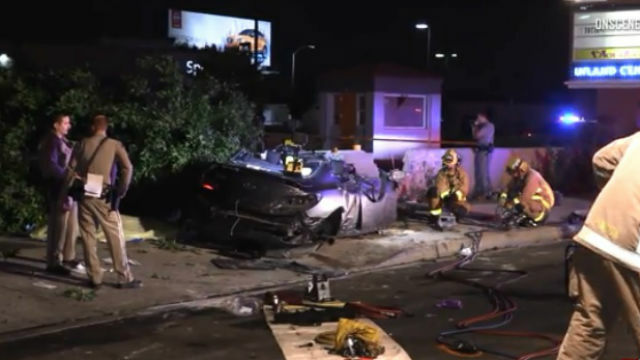 A suspected drunk driver was killed Saturday while attempting to flee from California Highway Patrol officers in El Cajon, the CHP said. Photo via OnScene.TV. A suspected drunk driver was killed Saturday while attempting to flee from California Highway Patrol officers in El Cajon, the CHP said. Officers spotted a Hyundai speeding and weaving on eastbound Interstate 8 near Severin Drive around 2 a.m. and tried to pull the car over a couple of miles down the road, near state Route 67, CHP Officer Travis Garrow said. The man behind the wheel, who officers believed was under the influence of alcohol or drugs, refused to stop and continued on I-8 before exiting the freeway at Second Street in El Cajon and heading south at “an extremely high rate of speed,” Garrow said. Not long after the chase began, the driver lost control of the car and crashed into a tree and a retaining wall near the intersection of East Main Street and North Second Street. The man died at the scene, Garrow said. Officers weren’t immediately able to ascertain his identity.